The history, manufacturing process & uses of asbestos textiles, fabrics, and fibers used in such products as fireproof blankets, safety clothing, packings, clutch facings, brake linings, plastics, and filters. Page top photo: an asbestos textile weaving operation showing standard magazine creel and loom creel - Adapted from Rosato (1959) . This articles series about the manufacture & use of asbestos-containing products includes detailed information on the production methods, asbestos content, and the identity and use of asbestos-containing materials. These questions and answers about asbestos cloth, fabrics, or asbestos textiles used in a wide variety of forms over many years were posted originally at ASBESTOS TEXTILES - you'll enjoy reading that article. Asbestos was used in or as upholstery fabric in some special applications where fire resistance was needed, but not likely to have been in most ordinary fabric-covered furniture. Examples of asbestos use in fabrics are given by more article links at the end of this page and in the ARTICLE INDEX found there. Was asbestos used in upholstery fabric like to cover chairs and beds for home use? The fabric I am concerned about looks like gold and silver silk materials. With the caveat that nobody can determine the presence or absence of asbestos in a fabric by photos alone, I think that it's unlikely that a car blanket would have been woven with asbestos, even an old one. The material in old car blankets I've seen is usually wool or sometimes a combination of wool and felt. Asbestos was used in textiles such as theatre curtains and in fire blankets used by fire departments. We discuss those in the article above. On 2017-06-25 by (mod) - asbestos in old car blanket? I have an old inherited blanket that I now think may be a fire proof blanket made in the early 1900's. It's an old car blanket about 6' x 4.5'. One photo is of just a small portion of the lint that came off after sewing on it. Before I washed it, it had a tacky, sticky quality to it -- perhaps some kind of resin. It caused me to do this research on asbestos in textiles. What should my next step be? All the diy home testing kits seem to be for construction materials, not textiles. I don't need rubber gloves or a mask at this point as we're already well exposed. Thanks for any recommendations. Thanks so much for your speedyreply, which goes a long way towards setting my mind at ease. Based on what you've said, I think I will not have a sample tested. I am very glad to have found your site via a Google search. It is very professional, and an extremely valuable reference: I've bookmarked it for future reference. Thanks again! I have not come across widespread use of asbestos fabric as normal indoor curtains in residential properties, though it would be likely to be found in theaters. If you find instances of that please let us know - use the page top or bottom CONTACT link to send details. We're happy to cite technical - content contributors if you wish. Shown here: an asbestos fabric used in a heating furnace air duct dampener. In the 40s through the 80s, was asbestos commonly used in heavy weight curtains intended for home use? Working indoors, I unfortunately cut up some older woven curtains found in storage to use as pet bedding before thinking about the potential for asbestos. I am uncertain of their age, but they are at the very last 20 years old, and could be quite a bit older. Thank you! Some old black "tar paper" or roofing felt used as air or moisture barriers on older buildings contained asbestos, particularly in homes built before the 1980's and more likely on homes built into the 1960's. Clear plastic under the mobile home was probably installed to try to keep out rodents or other pests. If you live in a heating climate the right place for a plastic vapor barrier is on the WARM side of the insulation - up against the under-side of the subflooring. Putting the plastic on the "wrong" side of insulation risks trapping water or moisture from above. IMO a better design for that climate is the use of a housewrap under the belly of the mobile home. That helps keep critters out but will breathe out any moisture entering from the warm side above. I have black insulating paper against my floorboards, then pink insulation, then clear plastic under my mobile home. It needs to be repaired in spots. That's how I found the insulating paper. Does that old stuff have asbestos? Should I reinstated the entire under belly using plastic next to the floorboards and take out all of the paper? Just bought a table that was made from a cellar door. When I flipped it over between the two layers was a gray felt looking layer. Could this be asbestos? Was it used to insulate doors? On 2015-12-23 by (mod) - Was asbestos used as a thin backing on yellow foam for chair upholstery? Seems unlikely except for special cases such as fire resistant theatre seating. However we have found asbestos used in a thin inner layer to improve bonding between a cover fabric and a foam padding in bicycle seats. 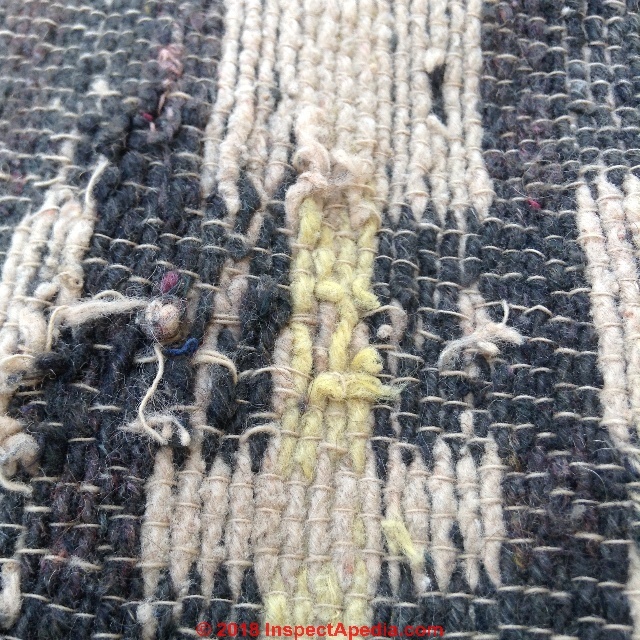 Was asbestos used as a thin backing on yellow foam for chair upholstery? I bought chairs from an old restaurant and found a gray fibrous backing on the backside of the foam. See FIBERGLASS HAZARDS for help with your question. Fiberglass fabrics or insulation are not asbestos and don't normally contain that material. My daughter bought an old pink flamingo couch that had been in storage for like 40 years. It makes me feel like I am breathing in fiberglass and can not even stay at her house. She has had a sore throat since she has had it but will not believe it is the couch. On 2015-03-26 by (mod) asbestos in child car safety seats? we have found asbestos used in a thin inner layer to improve bonding between a cover fabric and a foam padding in bicycle seats. Did the fabric cover of child car safety seats ever contain asbestos? I got a ride this morning with a neihgbor and he had a child car seat that looked v-e-r-y old. never saw anything like it. He said he inherited it from his mother in law. the fabric was grey and worn out. It said fisher price. Should I be worried about my daughter who sat in this chair and played with the fabric? 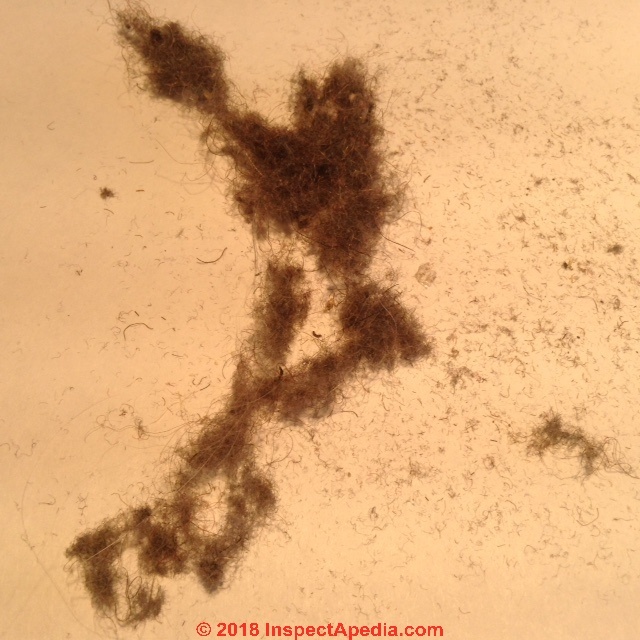 On 2015-02-16 by (mod) - asbestos in dining chairs? i have dinning chairs from the early 1930's that I would like to have re upholstered. They have horse hair and fiber material that I thought was cotton and wool batting. One upholstery business told me the chairs may contain asbestos. Is there any way I can know for sure? Asbestos was used in string-like gasket materials. And asbestos might appear in various products from China, even where not expected. You might simply dispose of the suspect twine, or have a samplet tested - let us know what you find. Fire blankets in the 1970s and earlier are likely to contain asbestos or to be made from a nearly pure asbestos fabric. Would a fireblanket from the early 1970s definitely contain asbestos or would it potentially just be fibreglass? On 2014-07-21 by (mod) - Yes asbestos was used to add fire resistance to mattresses. I've tried to address this uncertain asbestos mattress topic in several posts. Yes asbestos was used to add fire resistance to mattresses. We don't know how widely such products were distributed. And certainly by e-texting we can't know much about your particular mattresses. A forensic lab could examine a fabric sample if you need a certain answer. Otherwise it would be prudent in your case to treat the mattresses as PACM - presumed asbestos containing material. This is in part an OPM problem: a consultant spends your money (Other People's Money) to reduce his or her risk, because your questions are not ones that can be answered with certainty - at least not by texting - and you express a degree of concern. I have no idea how old the mattresses are. They seem to have been there forever. So even during the asbestos era it would be unlikely to find asbestos in the mattress? It wasnt commonly added for flame retardancy? I recall the post now among our FAQs. A look at our list of asbestos uses confirmed some mattress applications. Production most likely before about 1977. I add that ordinary consumer mattresses you'd currently find in a home are unlikely to have used asbestos and that it would be odd to find even a mattress from the asbestos era, the hazard turns on the condition, use, and location of the material. This site is very informative. Thank you for providing this resource. I saw a posting here before inquiring about asbestos in old mattresses. I cannot find it now and would also like information on this as we have old beds at the cottage. Is this a real concern? If so, when would these beds have been produced? Thank you for your help. Continue reading at ASBESTOS TEXTILES or select a topic from closely-related articles below, or see our complete INDEX to RELATED ARTICLES below. Articles on Asbestos in Fabrics, Textiles, Cloth, Upholstery Etc. ASBESTOS TEXTILE FAQs at InspectApedia.com - online encyclopedia of building & environmental inspection, testing, diagnosis, repair, & problem prevention advice.